Belgium Radio DJ’s Make Attempt at Saying IZ’s name. This is the funniest clip we have seen in a long time. We found this video in our YouTube, we love it! I think someone said “Israel Guacamole”! IZ hits #1 in France! “Over the Rainbow” went Platinum in Germany! Ok… maybe just his music. But, he’s definitely establishing a presence abroad. Fans are tagging IZ in photos they’ve snapped of his CDs on facebook. Check ’em out! Be our friend on facebook…. Become a Fan of IZ on Facebook and get a song! Become a Fan of IZ’s Official Page on Facebook and get a free download of “Hawaii ’78”! “Over the Rainbow” #1 for 8 consecutive weeks. Another IZ sighting…. Rosario Dawson’s Protest Playlist…..see IZ’s “Hawai`i ’78” at the bottom. If you didn’t get a chance to watch it….Here’s the Hawaii Five-0 episode 6 featuring IZ‘s Hawaii ’78…. the song ends the show. Israel Kamakawiwo`ole’s “OVER the RAINBOW” has been #1 for 3 consecutive weeks on Germany’s Top Hit Singles Chart! And Facing Future has moved from #17 to #11 on Germany’s Top Albums! Love those Germans! 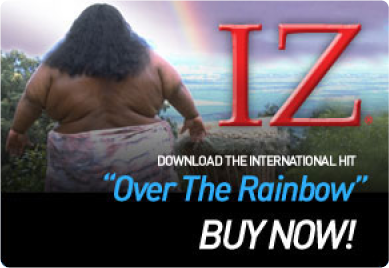 Israel “IZ” Kamakawiwo`ole’s ‘OVER the RAINBOW’ is at #1 on the German Top100 Singles Chart! How do you say Hawaiian Superman in German….Hawaiischer Supermann?! FANTASTISCH! Recently we were going through tapes we have from the early to mid 90’s and have been updating our YouTube channel. This week we have yet another “IZ Sighting” on NBCʻs hit show ‘America’s Got Talent‘. They used “Over the Rainbow” to introduce Alice Tan Ridley, mother of “Precious” actress Gabourey Sidibe. Anybody see this and notice? Over the Rainbow on “Glee” Tonight! We want your stories, photos and memories. We are only a couple months into this site and the best part of the Rainbow Ohana is all of your stories. It seems there are thousands of IZ stories, photos and memories and we want to hear them all…. This commercial might just be our favorite commercial to use “Over the Rainbow” There are so many great ones so its hard to tell, but this definitely stands out! Angelina Jolie’s touching tribute to her late mother. This is the official video for “Over the Rainbow” it currently has over 9.5 million worldwide views on youtube! The Kamakawiwo’ole name and where his music came from.